My mother, both my grandmothers and several aunts were always trying new things in the kitchen; they encouraged me to do the same. I can remember my mother trying a new recipe at least 4 or 5 days out of the week, every week, for years -- yes, years! She would find cookbooks that interested her and in some instances, try virtually every recipe in them. Some good, some not so good. One good thing though, no-matter what the recipe result, as she learned "what worked" or "what didn't," so did I. My mother taught me to be adventurous, to not be afraid to experiment. After-all, you have nothing to lose but boredom. She taught me to try new recipes and techniques. You may not like them all, but you are sure to make some new discoveries that could very well become life-long favorites. Tonight I wanted something I hadn't had in probably over a decade, chili-mac. 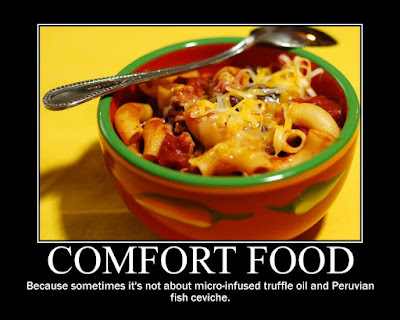 Not a fancy, upscale version of the comfort food classic. 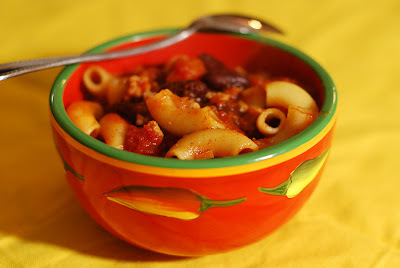 I wanted the basic chili-mac that Mom used to make 30 years ago. A quick google search and whose recipe just happens to pop up? You guessed it. My Mother used to make this easy recipe and I still love it. It's great for busy week nights. Cook macaroni according to package directions. Drain and keep warm. Cook ground beef with onion in a 6-quart saucepan or Dutch oven over medium-high heat for 4 to 6 minutes or until crumbly and no longer pink. Drain, if needed. Stir in chili powder and crushed red pepper (if using). Add tomatoes and beans; bring to a boil. Reduce heat to low; simmer for 20 minutes. Add cooked macaroni; cook for 5 minutes. Season with salt and pepper to taste. It was easy, hearty & warm. Just like Mom used to make. I appreciate that Sgrishka knows when to push the culinary envelope and when to let a simple classic stand on it's own. So, who is someone that is NOT a food blogger and inspires or inspired your cooking?